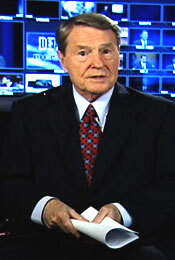 Throughout the last 20 years, Jim Lehrer has sat down with the presidential and vice presidential candidates to discuss one thing -- the debates. Through these revealing conversations he has learned more about what goes into preparing for and dealing with the most watched moment of the campaign. The result of these hours of conversations were two documentaries: Debating Our Destiny, which was broadcast in 2000; and 2008's Debating Our Desitny II. In this site you can watch both documentaries as well as read many of the interviews that went into making them. "The interesting thing about presidential debates is that I don't think you ever win them, but you darn sure can lose them." "My God, we're talking about global climate change, cancer, health, security, energy independence, pollution of our waterways, loss of our fisheries, countless issues and we had 90 seconds to talk about it in the most viewed moment of a presidential race."